Rats LOVE hammocks! 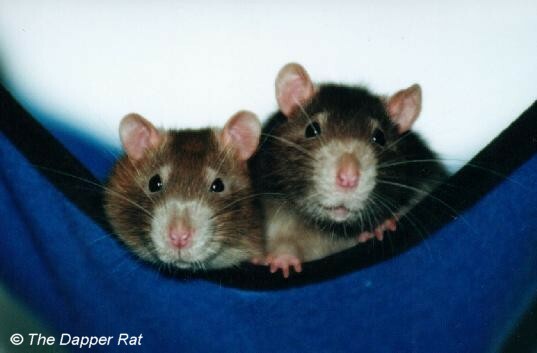 Just look at those cheerful smiles on Nimbus and Statty in their favourite hammock. About our hammocks - quality, colours, hanging, washing instructions, etc. Ordering details - hammock prices, postage costs, payment methods accepted and ordering information. Pocket hammocks make a wonderful addition to your rat's cage. 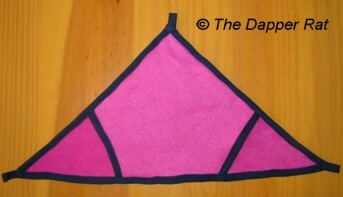 Made of soft, breathable polar fleece, they are brightly coloured, durable and machine washable. Pocket hammock are very versatile. In warmer weather your rats will enjoy sprawling on top of this comfy hammock. The pocket is cosy to snuggle into during winter or just to hide away from the light of day. 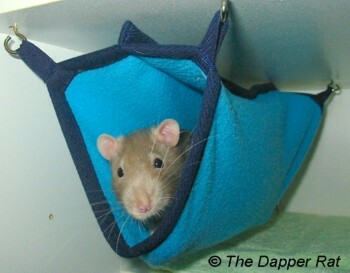 You can even hang the pocket hammock vertically on the side of the cage as a hanging snuggle pocket for ratlets. Custom sizes and shapes available on request. Corner hammocks are made from soft breathable polar fleece. They have a pocket for snuggling in. These don't have as much room to laze as a pocket hammock, but are large enough for several rats to sleep on. Large bucks may not fit inside the pocket, so this hammock is better suited to females or juveniles. They are handy for smaller cages where there's no room for a full sized hammock, or to add some variety to your rat's cage. Tube lofts are made from soft, breathable polar fleece, and are basically a long tube with hanging tags on the top. They hold 1-2 rats stretched out, or several rats curled up. Perfect for hanging underneath shelves and cage lids, or for use in cages with limited space. They can also be used as a bridge between shelves, or in place of a ladder as a fun tunnel between cage levels. Perfect for filling that gap under cage ladders or ramps, or as a cosy nest box liner in winter. 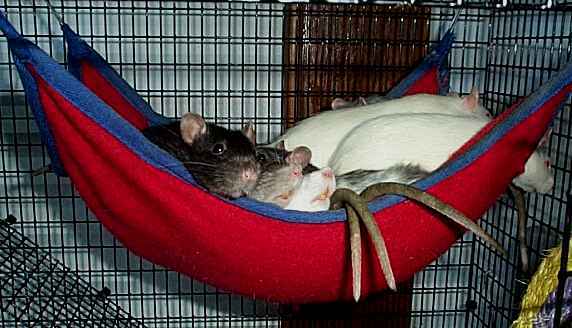 They're also handy for the warm lazing comfort of sick or elderly rats who cannot climb into hammocks anymore. 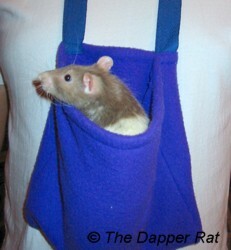 Carry sacks are cosy polar fleece sacks with a neck loop so that you can carry your rats about with you (as Grub shows here). Perfect for a shoulder rat who wants to take a nap, for providing comfort and warmth for old or sick rats, and for socialising new rats. Also handy for young children to carry their pets around safely. Large: 28 x 28 cm (11 x 11") - suitable for several rats, or for a guinea pig, bunny or ferret. The 75cm (30") neck loop hangs the carry sack at around waist level on an adult. They can easily be shortened using a knot or safety pin, but if you would like a shorter length for children let me know on ordering. 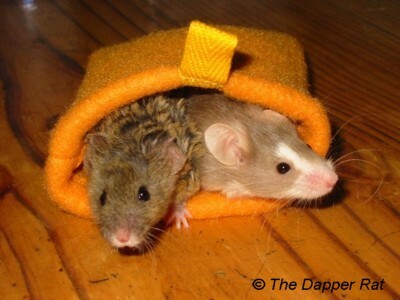 A range of small hammocks suitable for mice, made of bright warm polar fleece and finished with yellow trim. Hanging hooks are included. Pocket hammocks are a cosy place for mice to sleep. On the top during summer, or snuggled inside the split pocket during winter. Tube lofts can be hung up or laid on the cage floor as a cosy tunnel. Or used as a tunnel access way between cage shelves or levels. 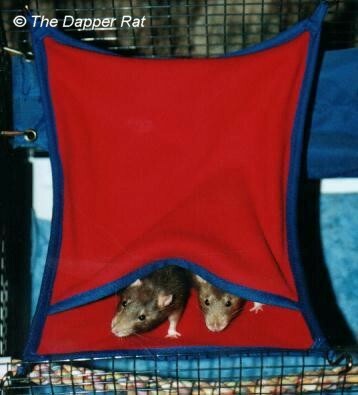 Snuggle sacks can be hung up or laid on the cage floor. 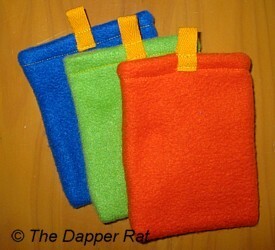 They can also be used as a mouse carry sack, just attach a clip/lanyard to the hanging tag. Note: Mouse sized climbing/play ropes are available from our Rat Toy range. 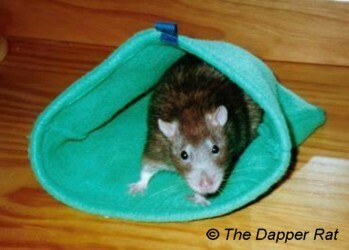 Our rat and mouse hammocks are made from high quality anti-pill polar/sherpa fleece. The trim is durable cotton taping and all hammocks are double stitched for extra strength with high quality polyester thread. All of our polar fleece hammock styles (pockets, corners, lofts, snuggle sacks, carry sacks, mouse range) are available in the following colours. Colour swatches below are as close to our actual polar fleece colours as possible. 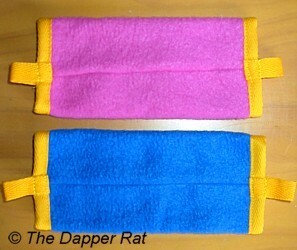 All rat hammocks made with navy trim. 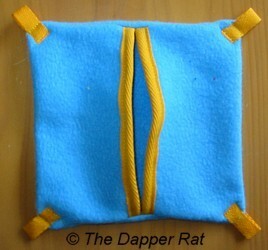 All mouse hammocks made with yellow trim. Note: Due to the seasonal availability of polar fleece, we don't always have every colour in every hammock style. Hooks: Hooks are available as a separate purchase (this is to keep prices down for return customers who may not require more hooks). 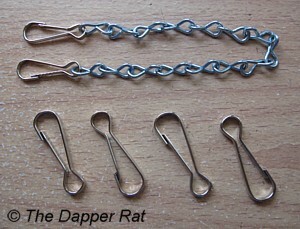 The hooks are 4 cm (1 1/2") in length and are a safe and secure spring hook style, as shown. Chains: If you require a chain/hook arrangement for more adaptable hanging positions, these are also available for separate purchase. Chains are 25 cm (10") at full length, and are adjustable to shorter lengths by folding back upon themselves. Note: Hanging chains and hooks are only available to customers who purchase hammocks. They are not available for individual sale, or bulk sale (i.e. only one set of chains per hammock ordered). Our hammocks are machine washable and dryer safe (warm only). They are not pre-washed. Expect a small amount of shrinkage of the trim on the first wash, so if fitting to an exact location in your cage, wash the hammock before placing the hooks. Rats will probably chew on their hammock. Always assume anything you put in their cage is eventually going to get "renovated". Mine tend to add a few new air holes to the pocket and then leave their hammock alone, but all rats are different and how your hammock endures will depend on the personalities and chewiness of your rats. Be sure to hang the hammock in a location where there isn't a large drop beneath if the rat falls / climbs out. Hanging hooks are smoothed to prevent sharp points, but they're safest hung so that the point faces downwards above the hammock tag, to prevent injury if a rat falls on the hook from above. If your rats chew on their hammock, inspect it regularly for potential entanglement risks. Polar fleece does not fray when chewed and is generally stretchy enough not to be a concern, but the cotton trim may become a risk if chewed. or with the addition of hooks or hanging chains to your order. Australian delivery times: 1 - 5 business days, depending on location. International airmail delivery times (estimates only): NZ 5-6 days. USA/Canada 7-10 days. UK 8-12 days. Email Robyn with inquiries or your order details (or email me directly at robyn <at> dapper.com.au). Be sure to include your location, the quantity, style and colour preference for the hammocks, and your preferred payment method. I will send you a final quote for your order and details for payment. Please DO NOT send payment before submitting your order.